In late 2015 Gilbert Romane and I embarked on an epic 23 day journey around Iceland, we planned and prepared for months, we read hundreds of articles, watched many hours of video and talked about our ideas and plans, we felt prepared for whatever Iceland had to offer and everything she could throw at us, little did we know she would throw a once in a 25 year storm at us while we were there. In this article/post/whatever it is :), I want to talk about how to safely travel Iceland, either during Winter (like we did), however you can apply it to any time of year. We were fortunate enough to be working with a number of brands, the amazing support from Lagoon Car Rentals was one of if not the most important. 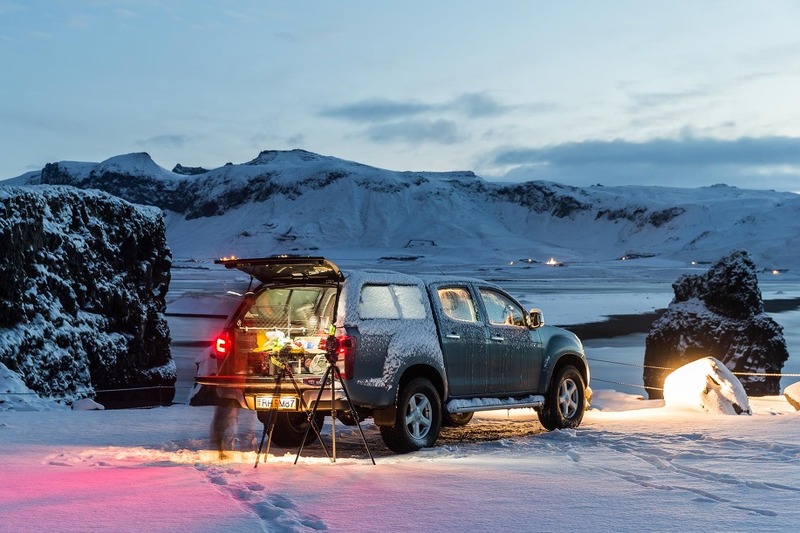 Lagoon supplied us with a brand new Isuzu DMAX with larger tyres, an enclosed canopy, safety equipment, and invaluable knowledge, the essentials for our 23 days around Iceland. When researching a trip to Iceland there are a few websites you need to use which will become your bible if you will, your daily movements start with these websites. road.is – (road.is) This is the official website for all road activity in Iceland, the website gives road and weather conditions and web cams which are scattered all over the island. The road conditions section is extremely important to monitor, you will be able to choose your exact location on a map, information will be displayed indicating the temperature, wind speed, how much traffic has passed, as well as important icons to show if there are stormy conditions, snow on road, if the road is closed, blocked, not passable and when they are cleared, we were stuck in a storm and monitored the website every 15min as it is updated in real time. road.is also offers links to Basic Information when Renting a Car for both Summer and Winter, which can be download here (Summer) and (Winter). vedur.is – (vedur.is) The official national weather forecast website. Plan your trip based on the weather when you arrive, look a few days ahead in the direction you are traveling and monitor the changes, it can change in the blink of an eye and you want to make sure you are prepared. The website will give you all the information you need, wind, rain, snow and even basic aurora/northern lights information. safetravel.is – (safetravel.is) We used this for major alerts, we checked it daily just to be sure. The website also had a section where you can leave your name, contact details and your travel plans, if anything happens officials will have an idea, they also offer a service where you can rent a Location Beacon, we didn’t require one as we were not going to far off the main arterial road, but if you plan to, perhaps think about this service. International Photographer Map. – (http://international-photographer.com/maps/iceland/) As a photographer you can do as much planning as you want but there will always be something you missed, well look no further, Michael from International Photographer has put countless hours in to producing a photographers guide and photographers map for Iceland, it is an absolute must not only as a photographer but even for someone just wanting to see Iceland, Michael has made it so simple, showing you by ranking places to visit, on a ranking system from must see photo spots to ones you could potentially miss, but its all there, and as a special bonus Michael has been kind enough to give me 2 of these to give away to loyal followers, I will have more details on this in the coming weeks. We kept our itinerary fairly flexible in case we wanted to stay longer in a location or move on, and with weather being a huge question mark in Iceland keeping your itinerary flexible is a good idea, we saw first hand the weather change from a beautiful golden sunrise with no wind to wind that would blow your doors off in the matter of a few hours. Even though Iceland is a hotspot right now its not like your standard tourist destination with millions of people, we went days without seeing anyone, especially on the Snaefellsness Peninsula, its somewhat out of the way for the main travel company’s to do short day trips, so what this means is be prepared, we stocked up on food and water to last us 3-4 even 5 days, where do you go to get supplies? we visited 2 places mainly, the supermarket chain called ‘BONUS’, you cannot mistake it, it has a pink pig money box as their logo, you will find everything in here, if you are from Australia its akin to an Aldi, Europe Lidl and the US probably Walmart, the other is the major Fuel stop called the N1, they are everywhere, they are just like your major gas station BP stops in Australia or Europe, majority of the time way over priced but the major ones have a pretty good selection of food outlets, some with Subway, but they have plenty to get you on your way till you get to a BONUS. Thanks to Jasline from FoodieBaker.com for the above ‘Bonus’ image :), they have written an awesome guide on Bonus and the different foods available, click here to have a read. The website I Heart Reykjavik has a list of supermarkets for the entire country – The Ultimate Guide to food shopping in Iceland. While we are on the N1 topic, lets talk fuel, make sure you fill up at every opportunity, you might not see a fuel stop for hours, manned or unmanned, prices are higher than normal for us, around $2AUD per Litre, try to get fuel in the major towns (which are few and far between) when you can. 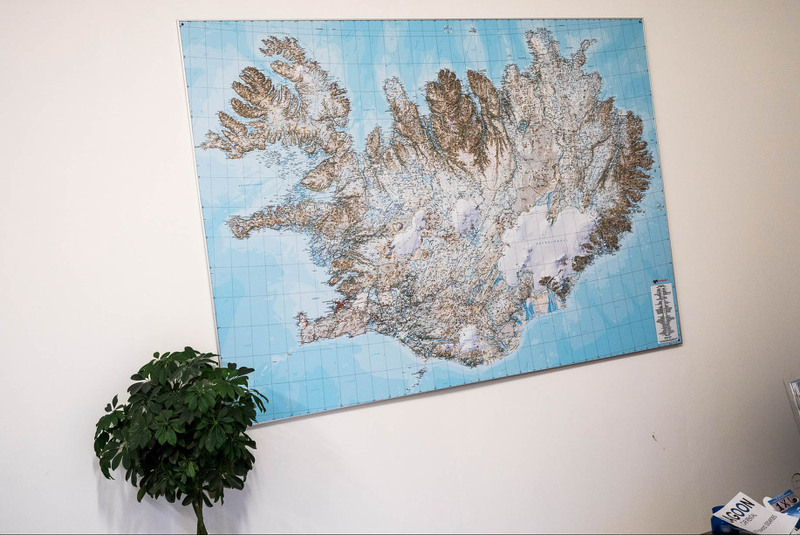 TripCreator has created an interactive map outlining where to buy fuel on the island – Gas stations in Iceland. We were in Iceland for work, creating content for our social channels and continually doing research on the fly so for us we needed to have access to the internet, the good thing about Iceland is its easy to obtain a SIM card in Reykjavik and its cheap, we got two different provider SIM cards just to make sure we covered our bases in terms of coverage, Vodafone is the major carrier and offered great service around the entire island. Where to go? we went to the main shopping mall in Reykjavik ‘Kinglan’, we paid 8790 ISK ($90AUD) for 200GB of data from Vodafone and 5290 ISK ($55AUD) from Siminn for 100GB of data, looking back we didn’t need half of it but it was cheap and we had it (https://vodafone.is/english/get-online/) , word of advise, don’t bother getting a voice plan and data, just install Skype on your smart phone and use that to make calls, you will save yourself a lot of money and with the introduction of Facebook Live and Facetime its very easy to stay in touch, I Facetimed my family while sitting at the foot of Vesturhorn Mountain waiting for my timelapse to end. Don’t go anywhere you don’t feel comfortable driving or walking. Its very easy to get caught up in the moment, easy to wonder off when you see an amazing scene. A favourite for many is the Fjaðrárgljúfur Canyon, a great place to hike, a great place for photography, a great place to see the beauty of Iceland up close and personal, but also a place where you could easily hurt yourself and be left alone. For the most part many of the locations in Iceland are very accessible by car then its usually just a short walk (no more than 5min) to a waterfall, Glacier, amazing cliffs, black beach, but occasionally you need to get out and walk a little, if you are adventurous and have prepared then go for a hike, some of the most beautiful places in Iceland are just a short hike away over a mountain, behind a waterfall or around the corner, but always remember safety first, comfortable and appropriate shoes are a must, we couldn’t believe how many people we saw in the heavy tourist locations that were wearing footwear that should have been for a walk on the beach in summer or shoes with no grip or support, your feet, legs and back are what keep you going every day and seeing more amazing places, without them or the right shoes you will limit yourself quickly and you wont experience the wonders of Iceland. So just a few quick tips. CB Radios/Walky Talkies. If you are not traveling alone bring CB Radios, aka Walky Talkies, they are invaluable, you can keep in contact with your travel friends while you are out and about, if something was to happen you can let each other know. Crampons. Spikes for your shoes, in Australia we were supported GripRox, these became a must when we were walking on a Glacier, in fact they helped on many occasions when we were near waterfalls as well, easy to use and grippy. Clothing. Be prepared for anything, we were in Iceland at the beginning of winter so we had prepared for extreme cold, at one point one night the temperature got as low as -18’C and it was bearable because it wasnt windy, however the very next day it was 7’C blowing a gale and was absolutely freezing, we didnt last 45min, its better to be over dressed then under dressed. Water. Make sure you have some, on one of the days we were out for almost 6 hours, you need to keep hydrated. Your phone. Have your phone with you and if you have it bring a small portable charger for it, open up some type of ‘Map’ app and set a drop pin where you leave from, this way if you get lost you can atleast find where you started and have some idea of how to get back, or download a fitness app and turn it on when you start, many apps track your movement and will show you on a map exactly where you have been, easy to trace back if something happens. As mentioned we were lucky to have Lagoon on hand with local knowledge as we needed it, for me with my Rally background and Gil with his 4WD adventure background we were both comfortable on unsealed dirt/rocky/snow covered roads, and we know when conditions are bad you take your time or stop and wait it out, we did both numerous times. 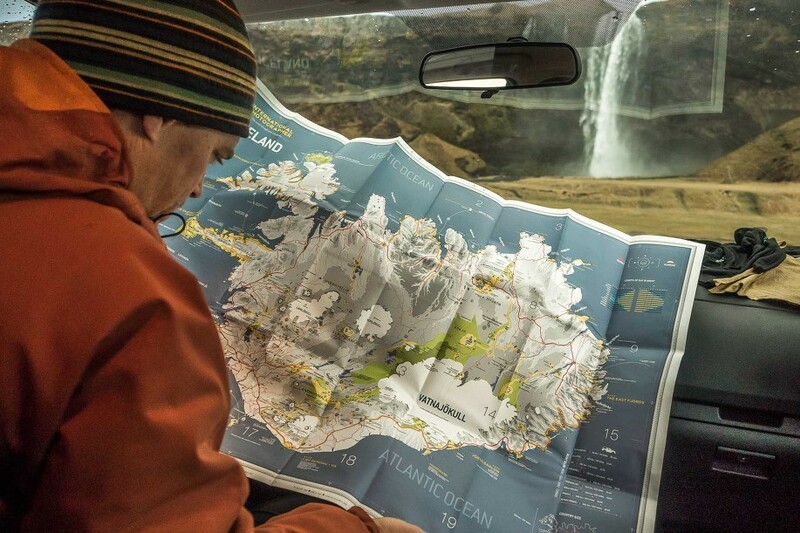 Check out my driving in Iceland article. For the most part the roads in Iceland are extremely good, in fact I would say better than so many other countries I have been to, even better than Sydney, however thats only on the main highway known as the Ring Road or the ‘1’, if you venture off unless in to a town then they will more than likely be dirt. Bad weather warnings, listen to them, everywhere you read about the weather in Iceland it states it can change very quickly, this is definitely the case, be prepared to just stay put if things get bad, and what the bad weather brings. We got stuck in Egilsstaðir because of the weather (as you can see above), when we arrived there was a light dusting of snow, within 12 hours it had risen close to 50cm, the Isizu Dmax which we had had no problems, I have another article which goes in to more specifics about the car here. As a result of the bad weather on one of the main secondary roads had not been cleared yet, however on the road.is website it showed that it was passable, when we got there it looked fine and looked like there wasnt enough snow on the road to get stuck, unfortunately that wasn’t the case, a snow drift had pushed quite abit of snow on the road which resulted in way to much for us to pass, however lucky for us the guys at Lagoon provided us with a snow shovel and we spent the next hour or so digging our way out of trouble. If you take anything from this it would be to do your research if you want to maximise your visit. If you enjoyed the guide/read please feel free to share it, and make sure you come back and check out the giveaway video soon. If you have any questions feel free to contact me on here, on Facebook or on YouTube.